Halloween is just around the corner and with it a whole host of scary sweets for your healthy teeth. It may be a fun holiday, but it’s not an excuse to sacrifice your teeth. It’s important to remember to always take care of your teeth. 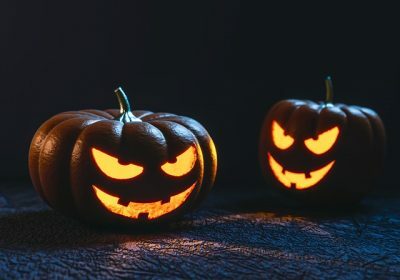 Dr. Ruchi Sahota of the American Dental Association (ADA) reminds us that “…if you don’t properly clean your teeth, the results might be tooth decay, gum disease, and possible tooth loss” and that’s scarier than any monster on Halloween! Teeth are particularly susceptible at Halloween because of the enormous amounts of sweets available. Gums and teeth are normally covered in bacteria. This bacteria is often referred to as “plaque.” Plaque feeds off of sugar and starch. When it comes into contact with sweets, the bacteria produce acid. This acid attacks tooth enamel, breaking it down, resulting in eventual tooth decay. In order to reduce the effects of this acidic reaction, it’s best to eat candies and starches with regular meals, not as stand-alone snacks. During a regular meal, your mouth produces more saliva which can help neutralize plaque acid. Additionally, you might try chewing sugarless gum after your meal. Chewing gum can increase salvia production which helps wash your mouth of unwanted bacteria. This Halloween, if you can, try to avoid candies that may stick to your teeth, such as gummies and taffy. Additionally hard candies, which tend to dissolve slowly in your mouth allow the bacteria and acid more time to attack your teeth. After your night of eating sweets, take the time to thoroughly brush your teeth. Another popular trend around this time of year is to wear vampire teeth. If you choose to wear them, know that wearing them for an excessive amount of time can irritate your gums. They can also trap food and sweets against your teeth, leading to a build-up of plaque. Eventually, this can lead to bad breath, gum inflammation, and cavities. To reduce the chances of later issues, be sure to brush your teeth after wearing any kind of fake teeth prop. Lately, there’s been an increase in cosmetic alterations to teeth. In an attempt to emulate vampires and other creatures of the night, people have started filing their teeth to points or fangs. This is dangerous and costly to reverse. Changing the structure of your teeth can weaken them and lead to bigger issues in the future. We strongly encourage you not to alter your teeth. Have fun this Halloween, but don’t forget to take care of your teeth! As always, remember to floss and brush thoroughly as instructed by your dentist.